I love my virtual friends! I was wandering around facebook recently when I came across Ingleside Farm. Turned out I'd popped by just at the right moment: Nancy was having a giveaway! I answered her question, and almost at the same moment, so did another Heather! Of course Nancy's next post was "Well done Heather!"... 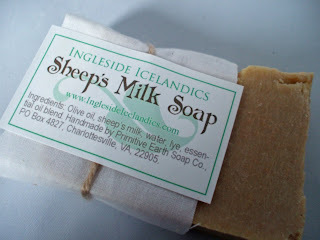 and she sent both of us a bar of her most unusual soap, made with sheep milk from her very own flock of Icelandic sheep. 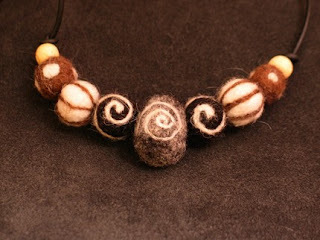 I love to find out more about my virtual friends, so I went to check out Nancy's shop www.NancyChase.etsy.com where I discovered this fabulous felted necklace - to me, it looks the next best thing to wearing a box of chocolates, delicious! This was not the only "random act of kindness" that was to come my way though. The postman delivered a gift from one of my buyers! 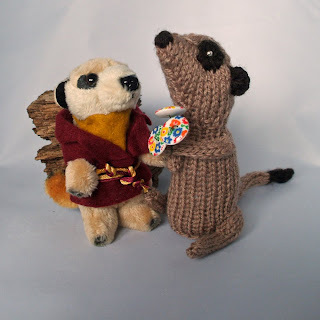 She'd spotted this little plush meerkat (seen here with my Valentine's Day posy-bringer) and decided I hadn't got enough meerkats in my house! Big thank you to Nancy and Rebekah - may your kindness be repaid many times over! Great post and that necklace is gorgeous...of to check out her shop. Thanks so much for your kind comments, Heather. I hope you enjoy the soap! What wonderful items! Thanks for sharing. Beautiful creations, and an eye for meerkats as well. This is one swell lady!